This section is really for first time buyers. If you already have equipment and it works stay with it, should it fail and replacements have to be obtained then this may help. which programmes are you going to watch? when are you going to watch them? in which country are you going to watch them? These points will dictate dish size, study satellite footprints to help you decide. If you will only view in the summer months in the uk, then a 45 cm dish will be fine even in Scotland or Ireland. If you will be travelling to Southern France in winter then a 60 cm dish is to be preferred, if you wish to go further south in winter then you might need an 80 cm dish. where are you going to store the dish while travelling? If you only have space for a 45 cm dish and you want to watch in Spain, buy a 20db in-line amplifier and hope for the best. Any dish has to have an LNB holder, I would only recommend one that has a standard 40mm LNB mount or holder. The reason for this is that should an LNB fail, a replacement either in the UK or continent will be easy to find. If you are using a Sky elliptical dish with the special oval LNB, carry a spare if going to the continent. For quick assembly and storage the LNB boon should be easily detachable without the need for undoing nuts and bolts. If the boon folds into the dish does this prevent it being stored against a flat surface. The larger the dish the greater the signal gain, but alignment is more difficult due to lower 'viewing angle' (Beamwidth), being approx 4 deg for a 45cm dish and 3 deg for a 60 cm. Remember that when consulting satellite footprints which state size of dish required, the suggested figures are for permanent installations where all year viewing under worst weather conditions is required. I have regularly watch Astra 2D in southern France during January/February on a 45cm dish and only occassionly in really heavy rain do I get picture freezing. LNBs are priced by their noise factor spec, at present the norm seems to be a .5 db factor, it should have offset graduations marked for picture quality adjustment and made from light weight materials. My first suggestion if you are a DIY person, make your own from wood or aluminium, it really is very easy, do not be afraid to drill the dish like I was when I bought my first many years ago. Allow in the design for sloping ground parallel to the dish face, otherwise you will receive a reduced signal strength. If the tripod is your preference, then two points of caution. Most cannot be adjusted for uneven ground and if not adequately pegged to the ground fall over in windy conditions often breaking the plastic LNB holder. I do not think attaching a dish to the van is a good idea because of surrounding trees. Often you are directed to a pitch and you either move or do without television. Being able to see the TV signal bars from the dish position is not necessary if you are using a Sat Meter and Compass. Digibox, BBC Freesat or Free To Air receiver ? No need to scan the satellite transponders to update the channel list. Excellent programme guide for up to 7 days into the future. Time delay to receive picture after switching on, this also makes alignment slightly more difficult because a pause is necessary after each dish adjustment. Twice the cost of an FTA receiver. 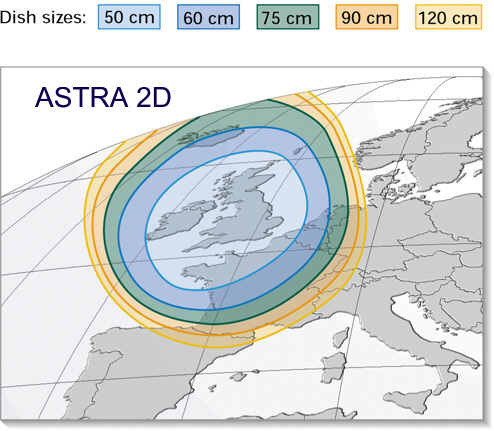 Can only receive Astra 28°E and a few Astra 19°E channels being limited to Symbol Rates of 27500 and 22000. Suffer from software lockup, only solution is switch off mains and start again. Interactive news programmes not yet available, but coming soon. Cost of HD boxes £150 . Able to receive FTA channels from any satellite. Poor programme guide, often only 'now' and 'next' programme information.